Steingruebl World Enterprises: Four Years Old! That's right, our girl turned 4 years old yesterday (December 4th). Huzzah! For some unknown reason, I neglected to take any pictures so you may have to take my word for it that she was adorable and fun and had a fantastic day. It's very nice to be doted on for a day, no matter what your age. The day started at 5:30am, when we heard loud and clear from upstairs, "Oh maaaaannnnn! It's hard to sleep all night when it's your birthday in the morning!" At this point, we figured sleep was no longer our friend and we'd better get up. Not being big on delayed gratification ourselves, we "did" presents first thing. Elise actually liked her new baby doll enough to play with it and snuggle it, which I considered to be a real coup. In times past, she's held dolls by a leg or a strand of hair and carried them at arm's length like they're radioactive or something. This one, however, she likes and I think it will be fun for her. Great Grandpa sent some really cute clothes at which Elise gazed with one eyebrow raised. Clothes are awesome when you're the parent trying to come up with cute stuff for your kid to wear, but when you are that kid they seem kinda pointless. Ah well. 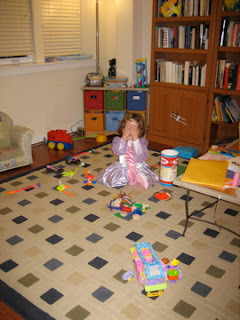 Along with the doll, we got Elise a kid-friendly digital camera. A spendy gift, but also sturdy and in its second design iteration so I figured it was probably worth the money. I remember how much I loved my first camera (though did not remember how I got it and loved hearing my dad tell the story when we called the other day) and what a new window on the world it was. On the one hand, film made every shot count and I was careful about many of my shots. On the other, careful can also lead to neurotic. I'm glad we've managed digital imaging for this generation. Picture taking has been good for Elise in another way that I was hoping for as well. She is often confused by perspective, and it's only recently that she has started to understand that I can not see which Candy Land card she's drawn unless she turns it to face me instead of just her. The camera seems to be giving her a lot better grasp of what she can see versus what others can see. And honestly, it's just amazing to see her working on documenting the most important things in her life. We have a lot of pictures of Mommy and Daddy and Flapjack, not to mention the stuffed bear and cat. At some point, we'll get the pics off the camera and post some of the more choice ones as a slideshow here. Elise's favorite gift of the day came from Grandma Char and Grandpa Karl. It's a little car and camping trailer made by Fisher Price. Two girls with a purple car and a pink trailer are all outfitted for camping adventures. Hours and hours of fun. This evening, she was pretending that various tinker toys were food to cook over the fake campfire so that the girls could have a huge feast when their friends came to sleep over. Awesome. There's a "radio" in the trailer that plays some cute little tunes and that gets us up and dancing. Elise REALLY likes this toy, and I don't blame her. It's cool! After presents, we made pancakes for breakfast and had a fantastic time with that. Then, more playing before friends Kaden and Danea arrived to play and then go out to lunch. They brought with them a beautiful princess dress which Elise wore with style and grace. 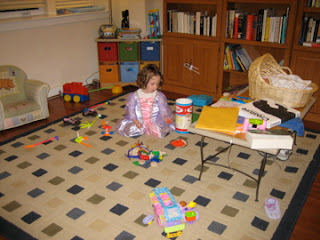 She may well have been born a princess and we never knew it. It was fantastic to see the three kids playing together and having so much fun. 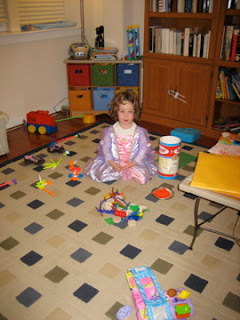 We were floored that Elise was so gracious about sharing her new toys with her friends. It was clear that she was just loving sharing her fun day with friends. The sort of thing that warms parents' hearts. Lunch, cupcakes, naptime, and then a trip to the doctor for Daddy. (His leg is mostly better-that was a good present for our girl, lemmie tell you!) We went out for dinner, and the fantastic waitress at the restaurant brought out an ice cream sundae for the birthday girl. The whole place lit up with the smile Elise produced when she saw it and the candle. How does such a small person get so big with joy personified? I dunno, but I love it. A fabulous birthday all the way around. Or as Elise said after dinner, "This has been quite the birthday, hasn't it?" Our big girl, four years old already.